LEN - www.lankaenews.com | President’s raving madness takes a turn for the worse ! 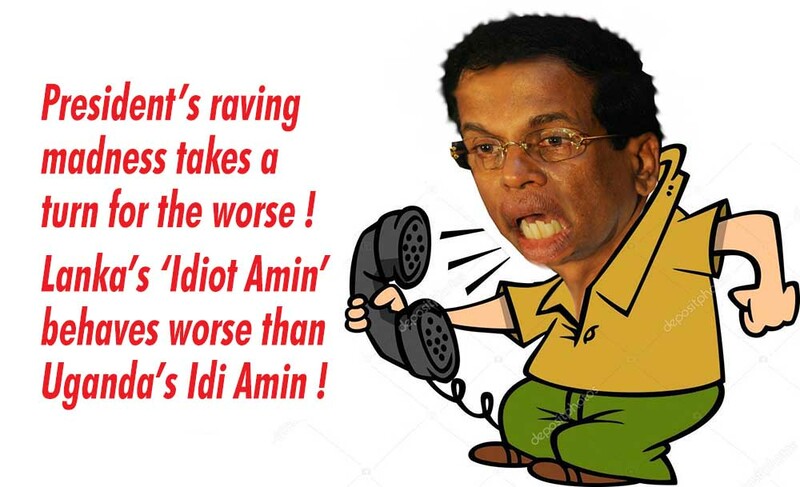 Lanka’s ‘Idiot Amin’ behaves worse than Uganda’s Idi Amin ! (Lanka e News – 15.Sep.2018, 10.20 PM) President of SL Pallewatte Gamarala who is by now widely known as suffering from mental disequilibrium due to mental stress and mental depression , and who some time ago chased out his own doctor after scolding in foul language .therefore now taking medicine (hissa kudicchi) secretly for his mental derangement , confirmed he is indeed suffering from a mental disorder when he issued a directive that the entire staff in the Sri Lankan Embassy in Austria shall be called back just because they did not answer his telephone call. This strange incident happened on 5 th September and Lanka e news is in receipt of information in this regard. President Gamarala at 7.31 p.m had called the SL embassy in Vienna , Austria on the 5 th and had asked for the SL Ambassador (female) . As it was after office hours, Ms. Priyani Wijesekera the ambassador , a senior state officer and ex parliamentary secretary had been away from office . The minor employee who answered the call had told the president that she was not in , when the president had wanted to speak to the next in command. Namal Wijayamuni Soysa the second officer ,a secretary of the UNP youth division who made a huge contribution towards propelling the good governance government to power ,had also been away in another city with the written permission of the foreign secretary , as he was fully involved in activities in connection with an impending conference. The president has then terminated the call abruptly …. The minor employee who answered the call had phoned the SL ambassador on her mobile phone and informed her. Priyani had phoned the president about 9 minutes after 7.40 p.m. The president has not responded to that call. Her attempts to contact him two or three times had also proved futile (all these including the times are on record ). When the day began on the 6 th , by noon letters were received from the foreign secretary ordering every member of the staff to come back to SL. By now all of them had been served with such letters. Two weeks after the occurrence of the incident that is by November 1 st , the entire staff had been recalled. Even the minor employee who answered the call being called back is the joke of the century . Madness that has no limit …. Even the most lunatic former leader Idi Amin of Uganda had not ever indulged in such a mad action . There has never been a leader in the historical stories who ‘cleaned up’ an embassy office of its staff simply because they did not answer his call made during ‘out of office’ hours. Only Idi Amin could have done that but he too did not , perhaps because he knew there will be another ‘idiot Amin’ , a bigger idiot than he in the name of Pallewatte Gamarala alias Sillysena after him who would do that . Because of the idiocy and imbecility of our ‘Idiot Amin’ the country will be losing financially as this ‘madness’ is going to cost heavily. The staff comprising 26 members are all living in rented houses. If they are to quit suddenly they will have to pay 3 months rent unnecessarily. The school fees of their children too have been paid and finished unnecessarily . Besides , all these payments must be made again for the 26 new staff members . It means because of this ‘madness’ of our local ‘Idiot Amin’ the country has to unnecessarily spend many millions . All because this mentally sick president , the modern ‘Idiot Amin’ took a phone call and he did not receive an answer from the other end. Whither Sri Lanka our motherland with an ‘Idiot Amin’ at the helm.? The time in SL when President took the call was about 4.00 p.m. though it was 7.31 p.m. in Austria . Our ‘Idiot Amin’ being an out and out imbecile who always thinks after he leaps must have concluded , ‘ are these staff members in Austria asleep at 4.00 p.m. ?’ An uneducated lunatic can never think sanely . Even Idi Amin of Uganda had this problem . He fled finally and went address-less. Our own ‘Idiot Amin’s’ fate is also written on the wall already – Idi Amin fled but the general consensus in SL is , our ‘Idiot Amin’ will perish without a trace long before his term. One : When a ‘terrorist’ SL ambassador to Qatar A.S.P. Liyanage well noted for his lunacy is facing grave charges of molestation there , the president Gamarala who does not give a damn about that , deems this trifling phone call incident as most serious, and decides putting his foot down to recall the entire staff. Two: There is a most strange side to this Idiot Amin’s melodrama : No one still knows what was that mysterious so very important call, and the most important message the president tried to convey via the un-responded call over which he went berserk .What were the massive benefits that so called urgent call could have reaped for the country is also unknown.